Sheridan Nissan is your place to lease a new Nissan vehicle in New Castle, DE. We also serve the Garnet Valley, PA region as well as Newark, DE and New Castle, DE. See our payments below. If you do not see a payment on a vehicle that you are interested in please contact us using the form at the bottom. 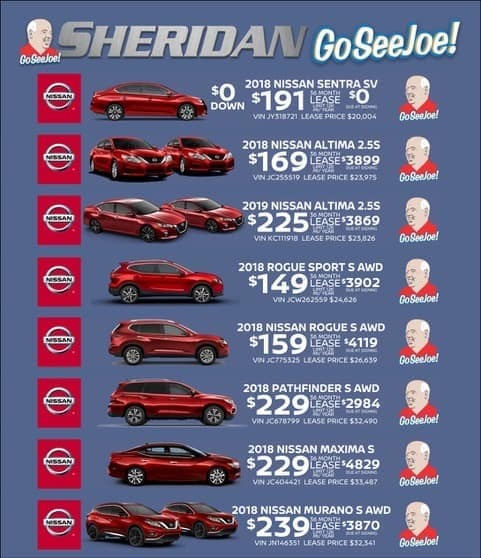 Go See Joe at Sheridan Nissan, and Go Lease a New Nissan at Sheridan Nissan in New Castle, DE!